Look, what I speak, my life shall prove it true;That Mowbray hath received eight thousand noblesIn name of lendings for your highness' soldiers,The which he hath detain'd for lewd employments,Like a false traitor and injurious villain.Besides I say and will in battle prove,Or here or elsewhere to the furthest vergeThat ever was survey'd by English eye,That all the treasons for these eighteen yearsComplotted and contrived in this landFetch from false Mowbray their first head and spring.Further I say and further will maintainUpon his bad life to make all this good,That he did plot the Duke of Gloucester's death,Suggest his soon-believing adversaries,And consequently, like a traitor coward,Sluiced out his innocent soul through streams of blood:Which blood, like sacrificing Abel's, cries,Even from the tongueless caverns of the earth,To me for justice and rough chastisement;And, by the glorious worth of my descent,This arm shall do it, or this life be spent. Dramatis Personae KING RICHARD THE SECOND JOHN OF GAUNT, Duke of Lancaster - uncle to the King EDMUND LANGLEY, Duke of York - uncle to the King HENRY, surnamed BOLINGBROKE, Duke of Hereford, son of John of Gaunt, afterwards King Henry IV DUKE OF AUMERLE, son of the Duke of York THOMAS MOWBRAY, Duke of Norfolk DUKE OF SURREY EARL OF SALISBURY LORD BERKELEY BUSHY - Servant to King Richard BAGOT - Servant to King Richard GREEN - Servant to King Richard EARL OF NORTHUMBERLAND HENRY PERCY, surnamed Hotspur, his son LORD ROSS LORD WILLOUGHBY LORD FITZWATER BISHOP OF CARLISLE ABBOT OF WESTMINSTER LORD MARSHAL SIR PIERCE OF EXTON SIR STEPHEN SCROOP Captain of a band of Welshmen QUEEN TO KING RICHARD DUCHESS OF GLOUCESTER DUCHESS OF YORK Lady attending on the Queen Lords, Heralds, Officers, Soldiers, Gardeners, Keeper, Messenger, Groom, and other Attendants SCENE: Dispersedly in England and Wales. Scene 1 London. KING RICHARD II's palace. Enter KING RICHARD II, JOHN OF GAUNT, with other Nobles and Attendants KING RICHARD II Old John of Gaunt, time-honour'd Lancaster,Hast thou, according to thy oath and band,Brought hither Henry Hereford thy bold son,Here to make good the boisterous late appeal,Which then our leisure would not let us hear,Against the Duke of Norfolk, Thomas Mowbray? JOHN OF GAUNT I have, my liege. KING RICHARD II Tell me, moreover, hast thou sounded him,If he appeal the duke on ancient malice;Or worthily, as a good subject should,On some known ground of treachery in him? JOHN OF GAUNT As near as I could sift him on that argument,On some apparent danger seen in himAim'd at your highness, no inveterate malice. KING RICHARD II Then call them to our presence; face to face,And frowning brow to brow, ourselves will hearThe accuser and the accused freely speak:High-stomach'd are they both, and full of ire,In rage deaf as the sea, hasty as fire. Enter HENRY BOLINGBROKE and THOMAS MOWBRAY HENRY BOLINGBROKE Many years of happy days befalMy gracious sovereign, my most loving liege! THOMAS MOWBRAY Each day still better other's happiness;Until the heavens, envying earth's good hap,Add an immortal title to your crown! KING RICHARD II We thank you both: yet one but flatters us,As well appeareth by the cause you come;Namely to appeal each other of high treason.Cousin of Hereford, what dost thou objectAgainst the Duke of Norfolk, Thomas Mowbray? HENRY BOLINGBROKE First, heaven be the record to my speech!In the devotion of a subject's love,Tendering the precious safety of my prince,And free from other misbegotten hate,Come I appellant to this princely presence.Now, Thomas Mowbray, do I turn to thee,And mark my greeting well; for what I speakMy body shall make good upon this earth,Or my divine soul answer it in heaven.Thou art a traitor and a miscreant,Too good to be so and too bad to live,Since the more fair and crystal is the sky,The uglier seem the clouds that in it fly.Once more, the more to aggravate the note,With a foul traitor's name stuff I thy throat;And wish, so please my sovereign, ere I move,What my tongue speaks my right drawn sword may prove. THOMAS MOWBRAY Let not my cold words here accuse my zeal:'Tis not the trial of a woman's war,The bitter clamour of two eager tongues,Can arbitrate this cause betwixt us twain;The blood is hot that must be cool'd for this:Yet can I not of such tame patience boastAs to be hush'd and nought at all to say:First, the fair reverence of your highness curbs meFrom giving reins and spurs to my free speech;Which else would post until it had return'dThese terms of treason doubled down his throat.Setting aside his high blood's royalty,And let him be no kinsman to my liege,I do defy him, and I spit at him;Call him a slanderous coward and a villain:Which to maintain I would allow him odds,And meet him, were I tied to run afootEven to the frozen ridges of the Alps,Or any other ground inhabitable,Where ever Englishman durst set his foot.Mean time let this defend my loyalty,By all my hopes, most falsely doth he lie. HENRY BOLINGBROKE Pale trembling coward, there I throw my gage,Disclaiming here the kindred of the king,And lay aside my high blood's royalty,Which fear, not reverence, makes thee to except.If guilty dread have left thee so much strengthAs to take up mine honour's pawn, then stoop:By that and all the rites of knighthood else,Will I make good against thee, arm to arm,What I have spoke, or thou canst worse devise. THOMAS MOWBRAY I take it up; and by that sword I swearWhich gently laid my knighthood on my shoulder,I'll answer thee in any fair degree,Or chivalrous design of knightly trial:And when I mount, alive may I not light,If I be traitor or unjustly fight! KING RICHARD II What doth our cousin lay to Mowbray's charge?It must be great that can inherit usSo much as of a thought of ill in him. HENRY BOLINGBROKE Look, what I speak, my life shall prove it true;That Mowbray hath received eight thousand noblesIn name of lendings for your highness' soldiers,The which he hath detain'd for lewd employments,Like a false traitor and injurious villain.Besides I say and will in battle prove,Or here or elsewhere to the furthest vergeThat ever was survey'd by English eye,That all the treasons for these eighteen yearsComplotted and contrived in this landFetch from false Mowbray their first head and spring.Further I say and further will maintainUpon his bad life to make all this good,That he did plot the Duke of Gloucester's death,Suggest his soon-believing adversaries,And consequently, like a traitor coward,Sluiced out his innocent soul through streams of blood:Which blood, like sacrificing Abel's, cries,Even from the tongueless caverns of the earth,To me for justice and rough chastisement;And, by the glorious worth of my descent,This arm shall do it, or this life be spent. KING RICHARD II How high a pitch his resolution soars!Thomas of Norfolk, what say'st thou to this? THOMAS MOWBRAY O, let my sovereign turn away his faceAnd bid his ears a little while be deaf,Till I have told this slander of his blood,How God and good men hate so foul a liar. KING RICHARD II Mowbray, impartial are our eyes and ears:Were he my brother, nay, my kingdom's heir,As he is but my father's brother's son,Now, by my sceptre's awe, I make a vow,Such neighbour nearness to our sacred bloodShould nothing privilege him, nor partializeThe unstooping firmness of my upright soul:He is our subject, Mowbray; so art thou:Free speech and fearless I to thee allow. THOMAS MOWBRAY Then, Bolingbroke, as low as to thy heart,Through the false passage of thy throat, thou liest.Three parts of that receipt I had for CalaisDisbursed I duly to his highness' soldiers;The other part reserved I by consent,For that my sovereign liege was in my debtUpon remainder of a dear account,Since last I went to France to fetch his queen:Now swallow down that lie. For Gloucester's death,I slew him not; but to my own disgraceNeglected my sworn duty in that case.For you, my noble Lord of Lancaster,The honourable father to my foeOnce did I lay an ambush for your life,A trespass that doth vex my grieved soulBut ere I last received the sacramentI did confess it, and exactly begg'dYour grace's pardon, and I hope I had it.This is my fault: as for the rest appeall'd,It issues from the rancour of a villain,A recreant and most degenerate traitorWhich in myself I boldly will defend;And interchangeably hurl down my gageUpon this overweening traitor's foot,To prove myself a loyal gentlemanEven in the best blood chamber'd in his bosom.In haste whereof, most heartily I prayYour highness to assign our trial day. KING RICHARD II Wrath-kindled gentlemen, be ruled by me;Let's purge this choler without letting blood:This we prescribe, though no physician;Deep malice makes too deep incision;Forget, forgive; conclude and be agreed;Our doctors say this is no month to bleed.Good uncle, let this end where it begun;We'll calm the Duke of Norfolk, you your son. JOHN OF GAUNT To be a make-peace shall become my age:Throw down, my son, the Duke of Norfolk's gage. 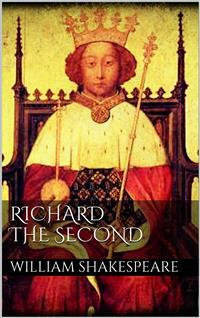 KING RICHARD II And, Norfolk, throw down his. JOHN OF GAUNT When, Harry, when?Obedience bids I should not bid again. KING RICHARD II Norfolk, throw down, we bid; there is no boot. THOMAS MOWBRAY Myself I throw, dread sovereign, at thy foot.My life thou shalt command, but not my shame:The one my duty owes; but my fair name,Despite of death that lives upon my grave,To dark dishonour's use thou shalt not have.I am disgraced, impeach'd and baffled here,Pierced to the soul with slander's venom'd spear,The which no balm can cure but his heart-bloodWhich breathed this poison. KING RICHARD II Rage must be withstood:Give me his gage: lions make leopards tame. THOMAS MOWBRAY Yea, but not change his spots: take but my shame.And I resign my gage. My dear dear lord,The purest treasure mortal times affordIs spotless reputation: that away,Men are but gilded loam or painted clay.A jewel in a ten-times-barr'd-up chestIs a bold spirit in a loyal breast.Mine honour is my life; both grow in one:Take honour from me, and my life is done:Then, dear my liege, mine honour let me try;In that I live and for that will I die. KING RICHARD II Cousin, throw up your gage; do you begin. HENRY BOLINGBROKE O, God defend my soul from such deep sin!Shall I seem crest-fall'n in my father's sight?Or with pale beggar-fear impeach my heightBefore this out-dared dastard? Ere my tongueShall wound my honour with such feeble wrong,Or sound so base a parle, my teeth shall tearThe slavish motive of recanting fear,And spit it bleeding in his high disgrace,Where shame doth harbour, even in Mowbray's face. Exit JOHN OF GAUNT KING RICHARD II We were not born to sue, but to command;Which since we cannot do to make you friends,Be ready, as your lives shall answer it,At Coventry, upon Saint Lambert's day:There shall your swords and lances arbitrateThe swelling difference of your settled hate:Since we can not atone you, we shall seeJustice design the victor's chivalry.Lord marshal, command our officers at armsBe ready to direct these home alarms. Exeunt Scene 2 The DUKE OF LANCASTER'S palace. Enter JOHN OF GAUNT with DUCHESS JOHN OF GAUNT Alas, the part I had in Woodstock's bloodDoth more solicit me than your exclaims,To stir against the butchers of his life!But since correction lieth in those handsWhich made the fault that we cannot correct,Put we our quarrel to the will of heaven;Who, when they see the hours ripe on earth,Will rain hot vengeance on offenders' heads. DUCHESS Finds brotherhood in thee no sharper spur?Hath love in thy old blood no living fire?Edward's seven sons, whereof thyself art one,Were as seven vials of his sacred blood,Or seven fair branches springing from one root:Some of those seven are dried by nature's course,Some of those branches by the Destinies cut;But Thomas, my dear lord, my life, my Gloucester,One vial full of Edward's sacred blood,One flourishing branch of his most royal root,Is crack'd, and all the precious liquor spilt,Is hack'd down, and his summer leaves all faded,By envy's hand and murder's bloody axe.Ah, Gaunt, his blood was thine! that bed, that womb,That metal, that self-mould, that fashion'd theeMade him a man; and though thou livest and breathest,Yet art thou slain in him: thou dost consentIn some large measure to thy father's death,In that thou seest thy wretched brother die,Who was the model of thy father's life.